Discussion in 'Members Gallery' started by TJJ, Aug 25, 2018. The SL55 with the SLK350 in the background. Can you guess what it is yet? It's what I was in to before MB came calling! Cyclone1, Alex, Abb and 1 other person like this. 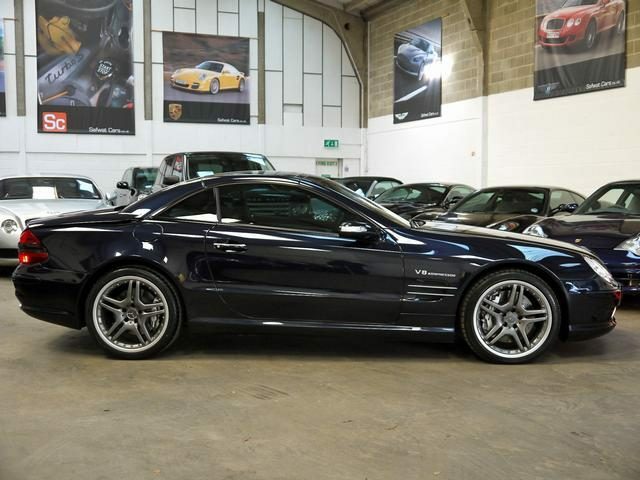 The SL55 looks superb, I’ve got be honest though not a fan of the turbine alloys! Funnily enough neither am I, but they were refurbished a year or so before I bought the car and had almost new tyres when I bought it so I'll live with them for now! Bought in January with 79k on the clock, now not far short of 83k and apart from the bits I've broken, all good! Bar the boot catch not self closing anymore, but that's a fix for the bad weather. Ah I see, you might be able to get a decent amount of money for them on eBay! These SLs look great with split rims! The only downside is they are quite expensive. Worth it IMO though! Peter103, GLK and Bobby Dazzler like this. They do look good don't they. The problem I have is that I'm not very good at keeping cars clean let alone making them look better. It's a weird thing for me. The SL is mostly a fantastic car, but if I'm being honest, I'm far more attached to the old SLK230. No idea why really, other than I spent a lot of time putting things right on it as it's was a pile of junk when my wife talked me in to buying it. The SL I just get in and drive it. I check the oil and try not to lose my license, or get caught, but I just drive it. It will come off the road during the winter and get general maintenance and then we'll see how I feel about it. I'd have bit your hand off for the Monza I loved them with the 3ltr straight six, velour interior ..did yours have the digital dash or not? Did yours piss fuel all over the road like mine did due to shabby hoses that GM used back then? Certainly did. It was a no cost option back in the day, and people liked it! As you can see, it also suffered from the "Stuck in Km's" fault before I fixed it! It was a really crappy design so yes it happened a few times to me. Not with this car, but the previous Monza GSE I owned I built a one off 24v 3.0L engine for it so it would use a modified LE Jetronic fuel management and standard ancillaries, but I also converted the car from auto to manual. It spent quite a lot of time going sideways after that as they have quite tight LSD's as well! Well there's been a bit of water under the bridge since I last posted here. I've moved house and my son has been using the SLK230 for the last year or so. I got it back last week, so as all the Mercs were filthy we had a car washing afternoon. Now it's clean I need to fix all the broken bits my son has added during his possession. Apparently he's been quite busy on that front. In the mean time, I've got a clean photo of the three cars together. Cyclone1 and Smart320 like this.